In 2005, after the release of her book "Standing In The Light of My Truth" Maxx was interviewed by reporter and writer Christal A. Cooper via phone and email. CAC: How would you describe your book? SMM: My book exalts the human spirit and demonstrates the resilience of it. The essays are provocative and show that one is capable of withstanding whatever traumatic event that comes one’s way without any harm to one’s spirit self. They call attention to my belief that, because one is human and spirit, one have a natural response to recover from or adjust easily to change or misfortune. It integrates philosophy with methods and practices that promote self-awareness and self discovery. It honors the trials and triumphs of overcoming the challenges of being both human and spirit. The exercises are practical, and intended to help increase self-awareness and promote self-discovery. CAC: You write in Chapter 1 that God is not a religion, that He reveals Himself to all even if you’re not religious. Quote unquote. If you’re not connected to God by religion, what or who is He to you? Does He have a face? What does He sound like? Describe Him, and as you characterize, your “profound relationship” with Him. SMM: I’m sure glad you asked this question. God is the Energy that moves through my soul and extends out into the universe. He is the goodness that’s inside me. He is the strength that helps me face life’s challenges. He is the joy that I feel, the hope that keeps me moving forward, my reassurance. He is the love I feel for my children, my friends, my siblings. He is my aspirations and dreams—my destiny. He is my patience, drive, and perseverance. He is the writer in me, teacher in me, and yes, He is the woman and mother in me. He is my Maker—the producer and director of my life story. He is coincident, intuition, instinct, and gut feeling. Yes, He does have a face. I see Him in the faces of my children and grandchildren showing love for me. I see Him in everyone who has ever come into my life, even for a brief moment, and bestowed something good upon me. I see Him in every human being and situation—man and woman, girl and boy, rich and poor. I see Him in nature—a beautiful rose, a sunrise, a sunset, a snow–capped mountain, a blue sky, a rainbow. I see Him in animals—a cat, dog, goldfish, bird that comforts its owner. What does He sound like? He sounds like beautiful music, a soul-stirring song, a child’s cry, a lullaby, a soft voice, and roaring laughter. In nature, He sounds like a babbling spring, a strong wind, pouring rain, waves washing upon the shore, and even frogs croaking in the night. He sounds like silence. He is that comforting, reassuring, protective voice inside me. Concerning my “profound relationship” with Him, I don’t let anything, (anymore,) obstruct my heart from connecting to all the good that’s in the world in every shape, form, or fashion, and I see Him. I open my heart and connect to all of the sounds in the world that make me feel good inside or cause me to pause and listen intently, and I hear Him. I interpret what I see and hear, and everything that resonates inside me, and relate it to my own life or situation by remembering for everything there is a reason. Every time I look for a deeper meaning to things, I engage Him. Thanks for asking me this question! CAC: Would you characterize your book as a religious book or a spiritual one? SMM: It’s definitely not a religious book or a book about religion. I would characterize it as Philosophy (consciousness and thought) and Self-Help (Discovery) Techniques. That’s how it’s cataloged with the Library of Congress and where it will be shelved in bookstores. CAC: What made you decide to write this book? CAC: Why did you decide to self-publish rather than shop your book to a mainstream publisher? SMM: I could have shopped it, but I wasn’t inspired to do that. Self-publishing is no longer synonymous with self-defeating after the successes of many noted authors like James Redfield (a native Alabamian). He self-published “The Celestine Prophecy”, which was the book that helped shape my spiritual philosophy more than any other besides the stories in the Bible, and by word of mouth sold 100,000 copies before Warner Books purchased the rights to it for $800,000. Publishers turned his book down time and time again. I don’t know if my book will realize that kind of success (I’m hopeful), but my point is that Redfield believed so much in what he was inspired to write that he didn’t let a “Not right for our list” rejection letter stop him from getting his manuscript in print. He rallied his friends and supporters and got it done. I feel that way about my book. I have no doubt that, for me, self-publishing was the right way to go. Many people don’t know there are many famous authors who first self-published their book before a mainstream publisher purchased the rights to it...there are the likes of Edgar Allen Poe, (whose work didn’t gain notoriety until after his death,) Henry David Thoreau, Langston Hughes, Elizabeth Barrett Browning, Ernest Hemingway, Virginia Woolf, Mark Twain, Stephen King, Nikki Giovanni, W. E. DuBois, and L. Ron Hubbard (Dianetics), just to name a few. SMM: I spent a lot of energy, time, and cried a lot of tears putting my past in right perspective. I became enlightened by the experience. I found acceptance, and from that I was able to forgive. With that said, what’s left? Let go. Why keep holding on, hurting and suffering in silence? That’s what it meant, when you go through the process—and healing is a process—you are supposed to emerge pain free. Tears may trickle down your cheeks when you think about it, and that would be natural (in my opinion) because it was a sensitive time in your past. I found myself shedding a few tears reading back over what I had written about my relationship with my stepmother. I was not crying because I was still hurting. It was like I was watching a movie about someone else. I felt for the young girl who had to endure that kind of treatment for so many years. It was no different than watching a movie and crying because one of the characters had to endure some horrific treatment. But, that girl is now a grown woman, and she controls how someone treats her. As I write in my book, when I cried to George back in ’84, I was crying for the young girl and the grown woman. We were both still very much entangled in the pain of our past. His point was that if you are hurting and feeling sorry for yourself at the same time claiming a spiritual transformation from anger and contempt, (as I was doing at that time,) then you have not forgiven. At some point, you have to move past it. Since none of us know when our last day is, it becomes a matter of whether you want to leave this world with anger and contempt, and pain and suffering inside you. I believe, at some point, it comes down to simply a choice. CAC: In the autobiographical essay, you mentioned that you would watch your father from a distance “and remember how content he seemed when he was creating something?” Do you believe his creativity helped develop your own creativity; thus, he was more than a father in your story but a mentor in some way? SMM: Seeing my father so calm when he was making a bench or chair or table probably did help shape my way of using writing to close out the world. He probably turned to furniture making to calm his rage. That’s how I saw him— raging one moment, and quiet and peaceful the next. That’s exactly how writing became a part of my life—to calm the rage and give a voice to my emotions and feelings. So, you’re right—my father was an inconspicuous mentor in my life story. CAC: Why did you say that he was an “inconspicuous mentor”? SMM: I used “inconspicuous” because I don’t believe he was aware that I was gawking at him. He seemed in deep, deep thought, whenever he was making something. I used to wonder, ‘What is he thinking about?’ Now, I wonder if he knew I was there. Maybe, he did know I was there. CAC: Another question from your autobiographical essay. You wrote, “Those judgmental thoughts also tried to impose guilt on me for not being a traditional southern mother who sacrifices her career goals, her happiness, her destiny for the sake of her children.” Does this mean that the traditional mother is a better mother? SMM: No. Absolutely not. It does not make her a better mother. It doesn’t make her a worse one either. We all make choices. Every woman chooses what she believes is best for her. If she wants to live the role of a traditional mother and woman, more power to her. I always felt that if I didn’t find a way to be the best mother I could be and fulfill my aspirations and dreams, I would end up resenting my life. So, I found a way to have a deep relationship with my children that still exists to this day, and live life on my own terms where my desires and happiness were just as important to me as theirs were to me. It wasn’t always smooth sailing doing both, but it proved to be the right thing for me. CAC: You describe the 1980s as a time “of self-discovery, letting go, and spiritual rejuvenation.” Was there a specific event that triggered this self-discovery? SMM: When I look back on my life, I can clearly see that I’ve always been searching for the true meaning of life, and how I, specifically, fit into that. Moving down to L.A. in ’81 sparked my self-discovery. I needed something to make sense of life in general, so I went inside myself, since I couldn’t connect to whatever I was searching for on the outside of me. CAC: The 1980s was also a time in which you were awakened to what you were capable of as far as writing—was there a particular event that brought about this awakening and what piece(s) did you write? CAC: In several essays, you demonstrated the power of words. In Chapter 4 “I Am Not Nice!” Chapter 5 “How Great Are You?” Chapter 8 “Force of Words” and in Chapter 9 “Try Not…Do…Or Do Not.” I gathered in these chapters that you are addressing the importance of saying clearly what you mean and knowing what you are saying. In other words—good communication. How important is good communication in order for an individual to experience spiritual awakening? SMM: The old adage, “say what you mean and mean what you say” applies to everything communicated, as far as I’m concerned. On the other hand, for anyone to even consider anything spiritually demonstrates a belief in a power that is superior to one’s human self. Therefore, my belief is that the first step to embracing your spirit self is to believe. But to wake up spiritually, I believe you have to be able to ‘hear’. I don’t mean the process of perceiving sound. I mean to gain knowledge by ‘hearing.’ People can clearly communicate wisdom intended to inspire you, but if you’re not in the right frame of mind or place inside you to ‘hear’ in order to benefit from the inspiration, then you’ll keep sleep-walking with your beliefs until you get to that place. So, I believe, at least for me, that being in a place inside you where your beliefs have positioned you to ‘hear’ clearly is necessary to experience a spiritual awakening. CAC: Would you characterize your writing as being synonymous with this “good communication”? SMM: I want to be understood more than agreed with. I understand many perspectives, but I don’t agree with them all. That’s how some will receive my book. As far as whether my writing could be considered “good communication,” I strive for my writing to be evocative and unambiguous. In order for that to happen, I have to communicate effectively. I write plainly so that most people can understand me. CAC: Is it important to question God in order to experience spiritual awakening? SMM: I believe God is to you what you believe He is. I believe if I ask for understanding, He will bestow it upon me. It was necessary that I had a true understanding in order for me to fully wake up spiritually. So, I had to ask Him questions, and He gave me what I needed to know—no more and no less. As far as I’m concerned, the scripture “Lean not to thou own understanding” says it all. CAC: How important is it for an individual to be human? For an individual to be a spiritual being? How can one bring the two to perfect harmony? SMM: If you don’t subscribe to the belief that we are spirit and human, then none of this will make sense to you. God created us first spirit then human. Our spirit self is changeless and requires nothing. However, our human self is always changing because it is the catalyst that arouses our spirit self to live its power. Take for instance, as humans we can feel incredible sadness and intense anger. To relieve our suffering, most of us turn to our spirit self, which is equipped with God’s healing powers. Since we are human, we have to be convinced that there is another side to us. My belief is that adversity is just a mechanism to convince us that, at the spirit level, we are bigger, more powerful than our circumstance. Therefore, when I seek change, I turn to that part of me that is changeless—the spirit—for directions and guidance. For me, that’s perfect harmony—the human embracing the spirit. CAC: In the essay “Fear Not, Love Inside Out,” you write: “Envy is a bit more sinister than jealousy.” What makes envy more sinister than jealousy? In other words, what is the difference between the two? SMM: It’s interesting that you ask me this question, because I just recently watched a movie, based on a true story, that depicted what I described in my book. An envious person not only resents what you have, he or she wants exactly what you have. Nothing different. It could be your home, your spouse, your family, or your position. The person is obsessed with wanting to be you. The intent is to deprive you of what you have so they can have it. As I see it, jealousy is short-lived. It’s fleeting and usually about petty stuff. It seems to surface when there’s something ‘new’ involved. It could be over someone’s new car or new dress or new job or coming into money. As soon as the one who is jealous has something good that happens in their life or something ‘new’ to boast about, the jealousy ends. The jealous one doesn’t begrudge what the other person has. He or she just wants it because they feel if something good happens to someone else, it should happen to them, too, whether he or she deserves it. Unfortunately, I have experienced people in both groups. I have a girlfriend who spent years working with someone who was envious of her. But I now know that it’s just fear masquerading. That’s why I characterized them as symptoms of fear in that essay. 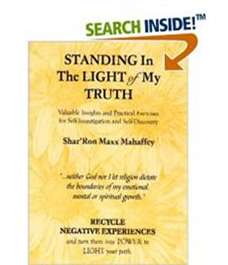 CAC: You write also in “Fear Not, Love Inside Out,” “For me, it entailed changing my mind and not my behavior. My behavior was a result of my thoughts, because what we think, we do. Therefore correction had to occur in the mind—the only level where change is possible and God’s guidance is needed.” How did you accomplish this? SMM: I use self-talk to increase my personal insight about myself. The mind is powerful, and I have found that you must constantly guard it against all of the “junk” that gets tossed your way. If a negative thought enters my mind, I challenge it. “What’s this about?” “Where did that thought come from?” I don’t bury it. I take it on. I delve deep for the real meaning. When I believe that I understand the origin of it and why it surfaced, I talk myself into a new understanding. There is no end to self-talk. I’m like a sentry when it comes to my mind. CAC: You wrote, “I triumphed over those negative words that my stepmother used on me but not before I went through an emotional hell trying to get them out of my mind.” Many people of verbal abuse often find that the hardest test is to not repeat what was done to them. What specifics can you illustrate that helped you overcome this? How did you triumph over those negative words that your stepmother used on you by not using them on your children? SMM: I just can’t imagine treating someone like that. Especially, my children. Whatever abuse I suffered, I didn’t want to pass that on to my children, or anyone. I just didn’t have it in me to call my children deleterious names, beat them with boards and braided tree branches, or brandish a gun at them. I can’t even imagine that happening. They wouldn’t have stood for it, anyway. I wanted them to love and respect me, not fear me. CAC: To follow-up on the previous question, I wanted to know specific steps you took, rather it was thinking certain thoughts, or meditating on a certain color that helped you not to speak to your kids the way your stepmother spoke to you. Something, perhaps, the reader could mimic to see if it would work in his or her own life. SMM: I believe one does what one imagines one is capable of doing. I could never imagine myself consciously and deliberately, and in my right mind, causing my children to feel worthless and unloved. It is a horrendous feeling to have someone hurl words, dripping venom, at you like you have no emotions and feelings. Cussing out my children was not in my heart, even though I had been treated like that. And, thank God! So, I have nothing else to offer on this, except, do not imagine someone you love having to go through a horrific experience similar to what you went through. Imagine a different life for them. CAC: How did you come up with the six questions in your exercise “Private Self-Investigation”? SMM: They came to me by inspiration to help my sister, Angela, and I discover things about ourselves. As I wrote in the book, we were on this journey of self-discovery together for a year. I experienced some profound changes, and revelations that have helped me tremendously. CAC: Must one have to answer these questions in order to find that spiritual contentment? SMM: Although we have similar trials, we experience them differently. These questions helped me. But, they may not work for another. I believe, if taken seriously, one can benefit from the experience with this exercise. I realize there will be those who will discover something in my book that will help them move forward in their lives. Others will not. So, no, you don’t have to answer these questions in order to find spiritual contentment. CAC: Are these six questions only to be asked once in a person’s lifetime or as many times as needed? SMM: We evolve, and as we evolve we grow in awareness and become more enlightened. With that self-awareness, we discover new possibilities to explore, and limitations to accept. So to ask yourself, more than once in your lifetime, “What is possible for me and what limits my possibilities?” demonstrates a clear commitment to your own growth—in my opinion. CAC: Do you believe there is such a thing as universal truth? SMM: Truth is subjective. It is what you believe it is. No one person can claim exclusivity to the truth. If others share your ‘truth’ across the world, then your truth is universal. There are many ways to look at a situation, and still come away with truth. It’s just a matter of how you perceive it. CAC: What was the greatest challenge for you writing this book? SMM: My greatest challenge with this book was writing the autobiographical essay—hands down. It was not originally in the first draft of the book. It’s one thing sitting around or on the phone chatting with your girlfriend, reminiscing about the past. But to open yourself up to hundreds of strangers and expose your personal life is another story. About seven years ago, I had a dream where I was sitting in a chair in a large room naked with my right arm and hand covering my breasts. Having to answer this question brought back the memory of that dream. That’s how I felt writing my autobiographical essay—naked. CAC: Why should someone buy your book? What would be the benefit to them reading it? SMM: I would recommend someone to buy my book because it is a treasure trove for contemplation and enlightenment. If the person is seeking those things, there is ‘something’ in it to help him or her discover it. Whatever that ‘something’ the reader gains from my book will be more valuable than the cost of it. CAC: What are your expectations for this book? I mean, how do you see it doing in the marketplace, impacting people, etc. SMM: I only expect good things for my book. We have similar trials and triumphs, and by sharing our life experiences is how we find the answers we seek to life’s questions, and how we advance our own personal and spiritual growth. It’s what resonates most with us more than anything else. I have been changed or encouraged or inspired or motivated by ‘something’ someone shared with me about their life. Since my book is mostly autobiographical, I expect it to do likewise. CAC: Do you think your book will be controversial? SMM: It shouldn’t be. It’s intended to be enlightening. I do believe my book will provoke deep discussions and soul-searching. It’s a book for those looking to increase their awareness. I offer them my perspective for their enlightenment. CAC: This will be the last question. What do you think your critics will say about your book, and what do you say to them? SMM: Constructively, a critic may say that I didn’t go far enough in explaining my perspectives—they’re too simple and straightforward. I would say, there is a natural end to each chapter. I did not want the reader so barred down in how I did it that it causes them to feel beleaguered about their own progress because they’re trying to do it exactly like I did it. I’m satisfied that I have expressed enough relative insights in each chapter to benefit someone’s personal and/or spiritual growth. The reader can, if he or she so chooses, take what I have written into their heart, contemplate on it until it makes sense to their own life or situation, and then decide his or her course of action, if any. I feel confident in my approach because I believe each human being has innate wisdom. That is—we come into the world with all we need to know (spiritually) already inside us. We just need some ‘thing’ to awaken us or simply inspire, encourage, or motivate us to stand in the power of what we know. An essay or exercise in my book could be the ‘thing’ that causes that to happen.